I have not seen a stretch of majesty as long as US 395 through California, ever. That’s to say, there are places wonderful aplenty in this nation, but it just doesn’t stop when it comes to the Eastern Sierras. Without further ado, I present you a series of short tales on how and why one might immediately drop whatever is in there hands, replace it with a steering wheel, and get to this wonderland as quickly as possible. Heading north on US 395, as the Joshua trees fade and the mountains rise higher ever still, there is a small shack just west of the road. Like much of this area, and the deserts of America in general, there is nothing particularly astounding about this small, dilapidating shelter. Except that it’s been adorned with dummies in the windows to remind you that everything can be strange, if you just give it the chance. It’s also a little freaky. Welcome to the Eastern Sierras. The small towns that line the leeward basin of this stretch of the Sierra Nevadas are not without chain stores. They’re not the top notch kind of places we typically praise. What they are is idyllic for what they contain relative to what they give you immediate access to experience. 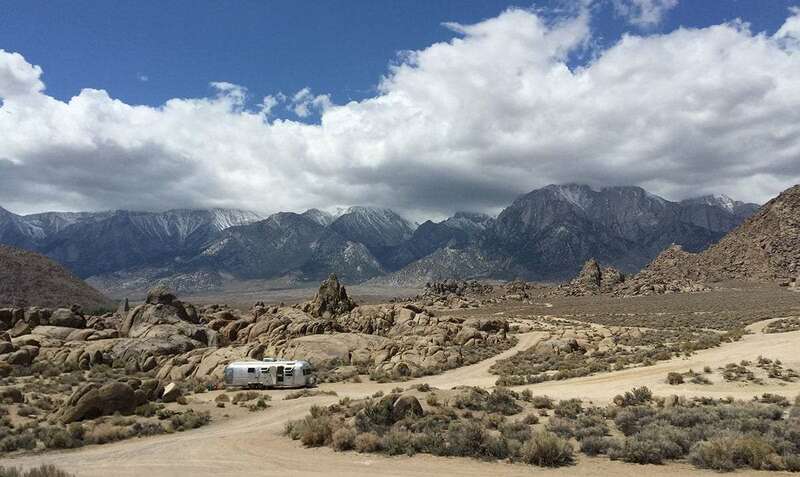 If you’re looking for an example, take the myriad of campgrounds surrounding Lone Pine, California. Sure, you could pay thirty or forty bucks a night to stay in a fairly decent RV park, or twice that to hole up in a hotel, right here in Lone Pine. But if you’re feeling like a man born to stare up at the stars, have the mountains cast their shadow on you, or just plain drink ’round a fire, then I have somewhat epic news for you. That’s cheap or free. Take Lone Pine Campground, a National Forest site. Mt. Whitney rises above you from nearly any campsite’s western view. Black locust and tall pine trees drop shade all over. The spots are a little close together, but there she stands, screaming down with her snowy white caps to “Look at me, for I am the tallest mountain in the continental US!” And she’ll only charge you $17 / night to do it. No hookups. Vault toilets. 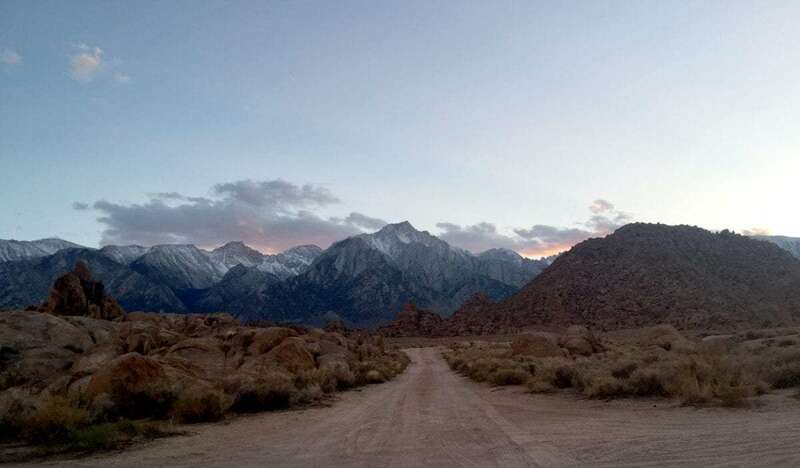 The Inyo Mountains as seen from Lone Pine Campground. Closer to town are the Alabama Hills. Unlike the National Forest campgrounds, this is a free for all. Just several miles of dirt roads, massive boulders to climb on and wild open freedom. Not freedom like the stars and stripes. Freedom like you pay absolutely no money to stay there. Just don’t be the dickhead who parts right next to some other guy. “Right next to”, in this case, means more or less anywhere the guy who showed up first will have to see you at all. Unless you’re super cool, and you can both party down all night like 1999 was never even a thing. Neither spot will be serving up much cell service at all. Tough it out, it’s good for your brainstem. The Alabama Hills, along Movie Road. 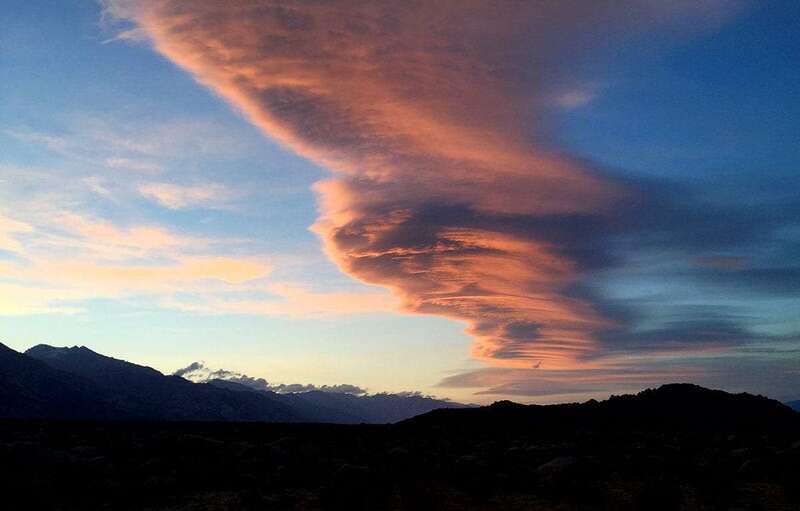 A Sierra Wave cloud formation, as seen from Tuttle Creek Campground one particularly wonderful evening. About a month back in Joshua Tree National Park I was hop, skippin’ and a jumpin’ from boulder to boulder when the heel of my Doc Martin-made boot just came a-right off. I tried superglue. I tried praying to the gods of leather, the patron saint of bootsmithing, and even did some tai chi on the hindquarters of a rubber tree. Alas, none of it proved any more successful than trying to get affordable health care when you’re a freelance writer, so as we let our toes drag around the streets of Lone Pine, I decided we might do well by me to give the local shoe store a knock. “Can I help you folks?” he said, an old man, dressed in the garb a lifetime farmer who owned his own small plot of land might call work clothes. “I’m looking for some boots,” I replied. He was stern of gaze and slow to make much of a motion at all. “That’s a foreign boot,” his words short, poignantly spoken and seemingly directed at some vast echoing canyon far beyond my own ears. “We’ve got these,” he said, pointing to a set of three boots, all in different colors, and by the same manufacturer, but in different styles. “This here’s the 2120,” he lifts a casual shoe up, as I’d call it, something better fit for a punk rocker gone to church. “What kind of work do you do?” he asks me, cockeyed at this point. “Well actually, I’m a web designer. I just want the boots to get up in the mountains.” And I do get up in the mountains. He proceeds to bring me every boot except the one I keep asking for. “This one’s on sale for $187,” he says, dropping a box with the Timberland logo on it. I realize he still thinks I’m looking to saw down a tree for money and ask to see the boot I wanted again. “Well this pair will only run you $195,” and now he’s got some sort of industrial work boot with a steel toe happening. He looks at my Doc Martins again, a very loose leather type, not your typical waffle maker badass Doc you might imagine young girls who want to be Sid Vicious’ kid wearing. “That’s a foreign boot.” His replies are irritatingly to the point. “You can’t resole a foreign boot,” he says. I feel like he’s a liar. “Can I see this one then?” I ask again for the boot I’d originally wanted. He climbs a ladder to a loft where he keeps this particular shoe I’m after. “I’ll just let you know, this one costs $260.” An episode of Bonanza is playing on the TV behind the boot resoling station he’s got setup just next to where I’m sitting. I feel like he thinks we’re poor. At this very moment, we are, but not usually. I try the boot on. “Do you have it in brown?” I ask, the natural color of this particular variety only coming in a red flavor. “That there is Irish suede,” he says. Months later, and absolutely no oil except what I’ve accidentally spilled while changing the 5W30 in our van or refilling our generator’s tank, I’m still hiking, skating and not doing any manly work in them, with little to no sign of wear. Oh, Mountain, oh mountain! How you hang above the desert valley below, casting your snow capped shadow down over us, taunting us with your promise of a cool breeze or the shade of your massive pines as we sizzle in the sandy heat of summer. While your feet kick through the massive boulders and sage filled dirts of your desert boots, how you wear your mismatched outfit well. Pinyon pine trousers and Jeffrey pine and red fir jacket. Those trees, snow still falling between them even as June approaches, barely swaying back and forth like two kings bowing subtly to one another. And your naked head, free of life aside from what dares dot your snow with their wild footprints. Not simply the tallest mountain in the Continental US, but another slice of spectacular beauty that is but one piece of the puzzling grandeur that the Golden State enjoys. Mt. Whitney peering out from behind her companions. More of this story, or read all about these, the oldest living things on the planet. We came through a year ago, in April, and the road to the Bristlecone pines was closed due to snow. This year, in May, the same should have held true. But ever decreasing snowfall in this part of California has benefitted us, and the road open, we pointed our silver eagle at this Ancient Bristlecone Pine Forest. It felt a bit greedy to revel so happily in nature’s misfortune, and the trees could see it on our faces. While there was relatively no snow on the ground and we dropped the van into park and began our ascent into the forest, immediately the weather changed. Snowflakes fell, first slowly, and between the opening in the wooded canopy and onto our cheeks. Our young boys opened their mouths and let the cold dot their tongues, fill their lungs. The ancients stood, unwavering in the now blowing winds that threatened to turn us back. But we persevered, leaving tracks in the now inches of white powder covering the earthen floor. Some of these trees are 5000 years old or so, their needles all but completely gone, their smooth trunks wrinkled and writhing like arthritic fingers that never need to move. Finally, we approached an overlook, and where the White Mountains were clearly visible as we’d made our way up the mountain by vehicle, now just a stark white background persisted as far (or the opposite) as the eye could see. We admitted defeat as our clothing was more appropriate for the desert below, and the bite against our cheeks grew sharper. As we hopped back into our van a feeling of Christmas morning came over me and I was happy for the mountain to have its snow. 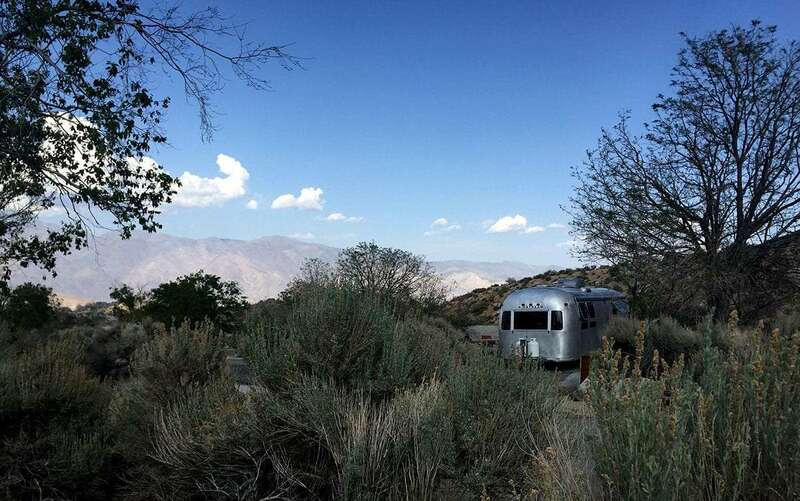 There are basically two options for camping near Bishop, California. The first is a slew of campgrounds owned by a company by the name of Brown. A small, ghost town themed park close enough to ride a bike to town by the name of Brown’s Town offered hookups, no sewer, and hot, paid showers. Smiling faces in a small campground store serving ice cream and cold beer while towering black cottonwoods kept the grounds shady, and were we making a recommendation, out of the private parks, it would be this in a heartbeat. National Forest and BLM land abounds as well, and for our money (or the lack thereof required), it’s the Volcanic Tablelands. For the whopping cost of absolutely nothing one can find a stretch of desert off the dirt road to setup and call home, spending your days climbing basalt or digging in the dirt, rarely disturbed by the signs of civilization, all while being only a ten minute drive from the conveniences of the biggest city for miles in either direction. 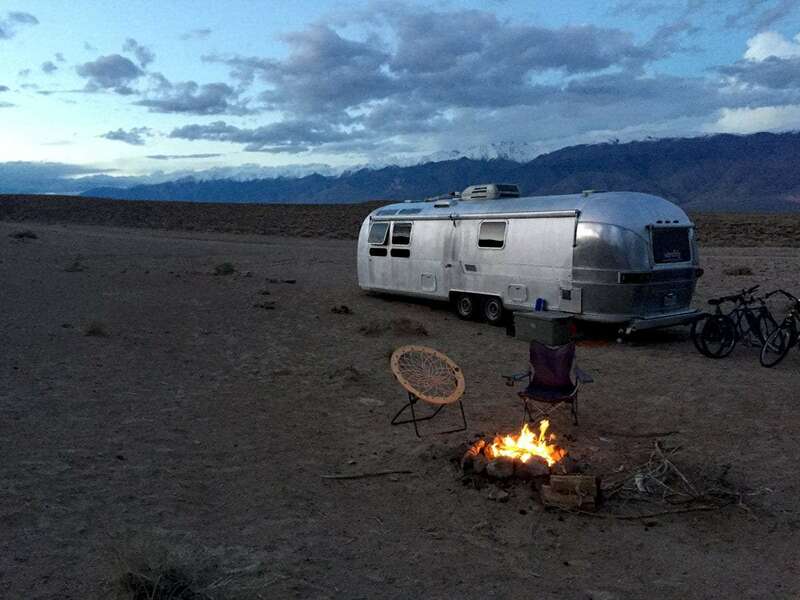 The White Mountains, Volcanic Tablelands, and Airstream enjoying his evening fir amidst it all. We sat in the grass as the teenagers local flipped their skateboards between their feet, spun ’round 360 off of the quarter pipes with their BMX bikes, and did backflips with their scooters as they launched out of the bowl. For a relatively backcountry place, these kids were good, even the youngest, all driving one another to be a little more fearless, to get a little higher. 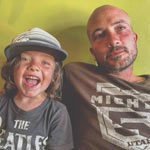 Foul mouths were abundant, but their prowess and the general acceptance that teenagers–particularly in the absence of parents–will be teenagers. No one was smoking. No one fought. Everyone gave way to one another as they raced back and forth like helmeted gazelles trying their best to be hummingbirds. And then, our last day there, my oldest son returned home to report that one of them had stolen his backpack. It held little of any actual value, a tree identification book and another journal in which he’d been writing down the names and descriptions of trees he’d been studying for school for the past year. Days prior one of them had stolen his water bottle, too. I was reminded of my own youth spent flipping wood and the trouble my friends and I got into, and was therefor able to let some of the anger I had toward some punk skater who would likely have just destroyed it all in attempt to impress his friends. Still, if I ever found that little skater and knew for sure it was him, I would happily focus his board right there. No wish through the Eastern Sierras cake would be complete with a few candles full of hot springs. And they abound. We set off on a mission to find some and were lead somewhat astray, pulling up to Hot Creek Geological Site. Signs everywhere immediately warned of the dangers, of drunks falling in and dying, of shattered glass along the springs’ floor, of hot, seriously hot, water. Our intention was to get warm in some water, not melt our skin off, but the water was gorgeous nonetheless. Steam rose up from pristine turquoise pools which cooled into moving water and then back into boiling areas again. The place stunk of sulphur. A fence made sure no one was foolish enough to fall in again. Unperturbed, we found Wild Willy’s hot springs just down the road. It was relatively unmarked, but after the second cattle guard as you leave US 395 to travel east on Benton Crossing Road look for a dirt road to your right. Follow it a short distance to a parking lot, continue on foot via the boardwalk, and prepare for nothing but good times. Beer is allowed, but please pick up after yourself and any other jacksticks who left their trash their before you. It was as though nature had some grand engineer, hired at the beginning of time to build the earth from lava, water and stone, and this was the shed where he kept his building materials. There is little to say about the nearly perfect, hexagonal columns of stone that are the Devils Postpile. They simply have to be seen. And it’s a bit of a long drive through a gorgeous forest of red firs to get there, but very much worth it in the long run. 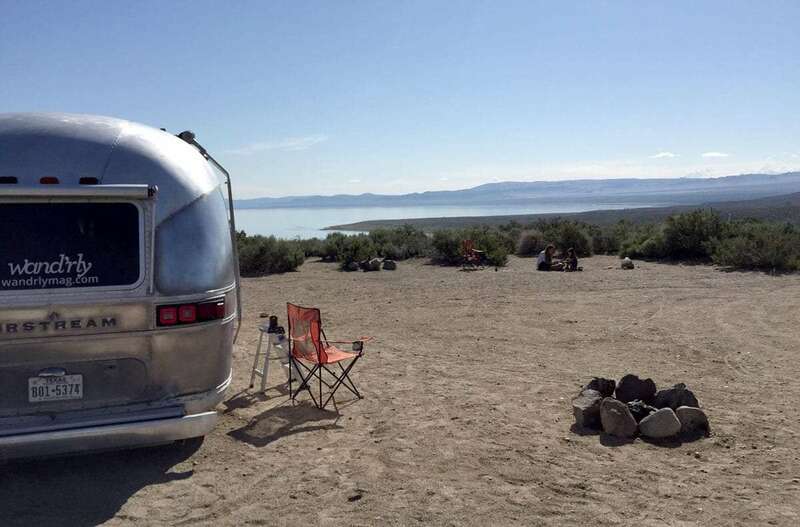 If you’re particularly interested in camping in Lee Vining, or just can’t find a spot in neighboring Yosemite, you’re in luck. 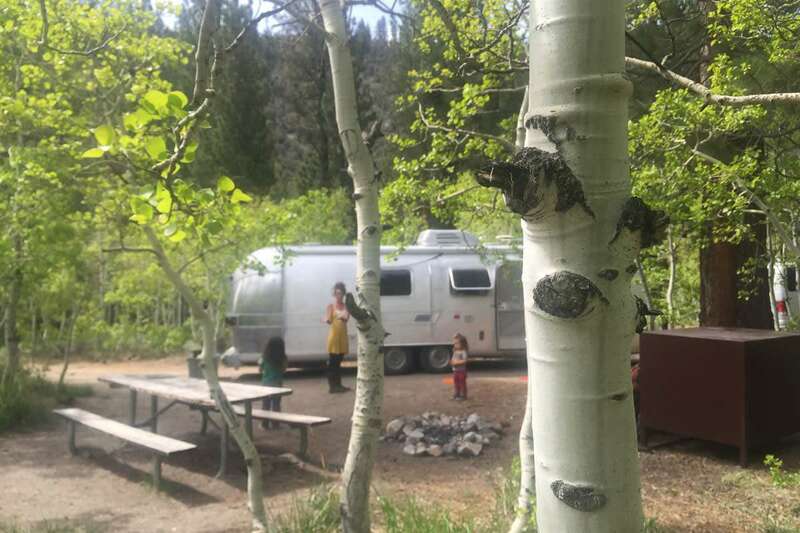 The first, a place of no cell phone signal and very little use during the day, is Lower Lee Vining, a National Forest campground abundantly thick with Jeffrey pines, mountain hemlock and quaking aspens. Sites are large enough for even Class As, but spaced out and private like every camper wants. A creek runs through it all, fast and frigid and serenity, if ever, becomes now. 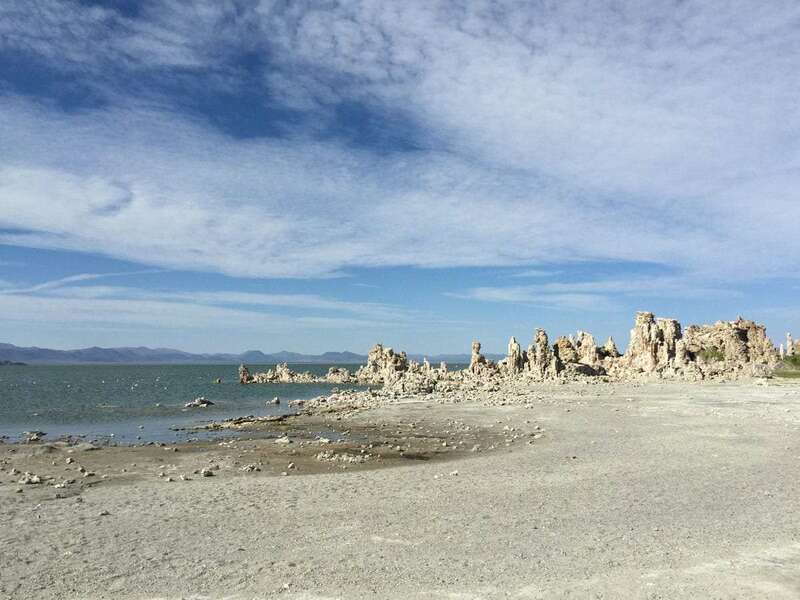 Even better, head south of town on US 395 a mile or two and make a left onto Picnic Grounds Road, heading toward Mono Lake. Less than a quarter mile down the road, on your left, is a pull out large enough to accommodate maybe two or three large RVs. This spot is perfection. Big sage grows all around you. The sun shines and you have views of various glory in every direction, from Mono Lake herself to the east to the snow Eastern Sierras to the west and various other mountains all between. Your phone will work. 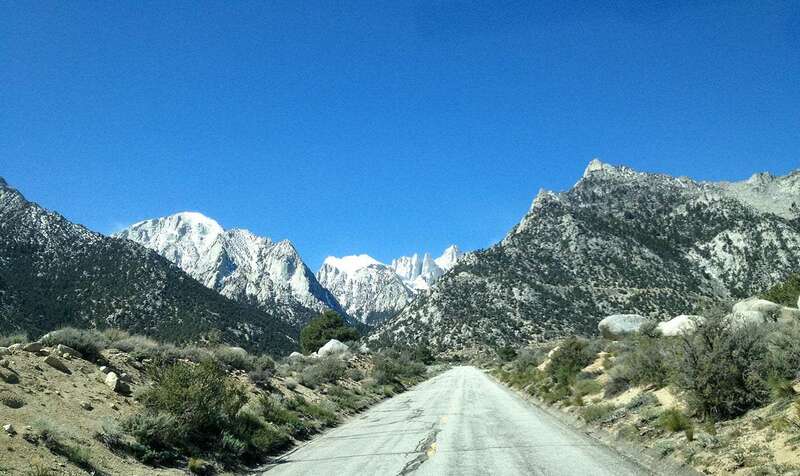 And you’ll be but five or ten minutes from all that Lee Vining has to offer. Los Angeles has been stealing the water that flows through the Eastern Sierras for decades. That a city hundreds of miles away should be allowed to own the water that keeps all of these small towns, wildlife and fish alive is a tragedy, but it is fact and after much legal battling, the practice is unlikely to stop anytime soon. Still, something arguably good has come from it. For millions of years, air bubbles rising from the bottom of Mono Lake would carry small bits of calcium up into the water. The air bubbles would burst, and the minerals would eventually begin to stack up. The stacks grew and grew, and the tufa was born. Los Angeles sucked enough water out of the streams that feed Mono Lake to drop its height significantly enough that we can now see these formations above water. And they’re beautiful, so thank you LA for what you’ve done, and please don’t do it again. “Can I get a pack of Turquoise American Spirits?” I ask the man behind the counter at the Mobile Station in Lee Vining. “You can,” he replies, snatching a pack from the shelf and placing them on the table in front of me, “but I don’t see what’s so American about them.” He wears a large, reddish beard and a tie dyed shirt. I pay and take my purchase with me. “I hope you don’t enjoy them,” is his farewell to me. I’ll return to this Mobile station several times while we stay in Lee Vining. They’ve got expensive gas, but less so than in the park or at the other gas stations in town. They got lots of good beer. And free water outside you can use to fill up giant jugs for camping. And pizza. And sushi. And it’s not gross gas station food. You can even drink beer there and watch a band a couple of times a week. And so, I will interact with this guy many more times. One day, while waiting for a pizza to be cooked, one that turned out particularly tasty, my lady runs over to the register to buy some beer for the evening and snacks for tomorrow’s hike. “That guy is a little,” she pauses, not one to be cruel, “rough around the edges.” I laugh. We’ve covered the Sierras in depth before. Len Wilcox talks about the region’s past in a similar article from about a year ago. From our initial reaction to Mt. Whitney over a year ago to both the Tioga Pass in Yosemite and the Giant Sequoias of the western slopes. Greetings from Mono Lake, Half Dome, or indepth articles on the Sequoias and even an entire issue dedicated to California’s Trees. Right down to our latest goodbye. A day or two later I am once again buying cigarettes. This time his two young daughters are visiting him at work. They’re incredibly cute and he sells me the smokes without much interaction. I think to myself, “What is not American about tobacco, really?” But say nothing. The next time I come in, he’s being downright cordial. “I’ve seen you and your wife and kids in here a bunch lately, did you move here?” I tell him our situation, that we’re full-time travelers, that I work from the road, and that we love it here and plan to stay for a few weeks. He welcomes me to the neighborhood, shakes my hand, we exchange names. “Do you believe in God?” he asks me. I don’t say much back, avoid the question. Sometimes the roughest edges have the most surprisingly soft hands, I think. I don’t see him again during our stay. I hope he and his little girls are as happy living in Lee Vining as I was to visit it. It should be a very sleepy town, this little foot of the mountains village of around 200 people. Instead, it’s bustling with young hikers, outdoor adventurers all of which look like they’ve just come from Woodstock 1969. Wild hair and draping scarves abound. They’re sipping coffee and rolling cigarettes and laughing and preparing to load into a van headed up the mountain to Yosemite National Park via Tioga Pass. I haven’t seen so many cool looking young people since San Francisco a few summers back. A baby boomer comes in and falls in line with the rest of us. The line is very long, even though there are at least two or three other coffee shops to choose from in such a small town. He looks us all up and down. I think he finds me a little out of place, I’m older than these kids and my attire is a little less dramatic. He wears a long grey pony tail and a polo shirt. Our eyes meet, and he nods toward the crowd and shakes his head a little. I divert my gaze. “$4 for a cup of black coffee?” he complains to the bohemian waitress behind the counter. Everyone goes about their days. I imagine the forest crawling with hipster elves all summer long. As glorious as this region is, we couldn’t stay forever. Read So Long, Eastern Sierras…. I truly did leave a piece of my heart on the 395, and I did so quite deliberately. This is a place we’ll return to time and again, setting off from Lake Tahoe perhaps next time, in a 4×4 campervan that we can take back any desert road, up any mountain pass. It’s not just the hot springs, or the forested alpine lakes. It’s not just the seclusion or the great hiking, the long stretches of open road or the abundance of great places to eat. It’s everything, and it’s kind of a secret. So grab an atlas and find the road while it’s still what it is.